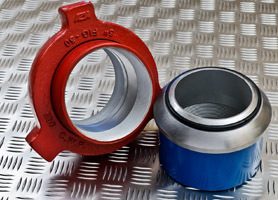 John Bell Pipeline Equipment Co. Ltd also compliment its range of Pipe, Fittings and Flanges with Hammer Lug Unions. The complete range of hammer lug unions is stocked at our facility. Standard features such as heavy duty construction, full tractability, sour gas service compatibility, compliance with all related piping standards and pressure ratings up to 20,000 PSI.